Amazon Web Services (AWS) is a well-known provider of cloud services, while Kubernetes is quickly becoming the standard way to manage application containers in production environment. Amazon Elastic Container Service for Kubernetes (EKS) brings these two solutions together, allowing users to quickly and easily create Kubernetes clusters in the cloud. This guide walks you, step by step, through the process of provisioning a new Kubernetes cluster using Amazon EKS and then deploying WordPress to the cluster using a Bitnami Helm chart. 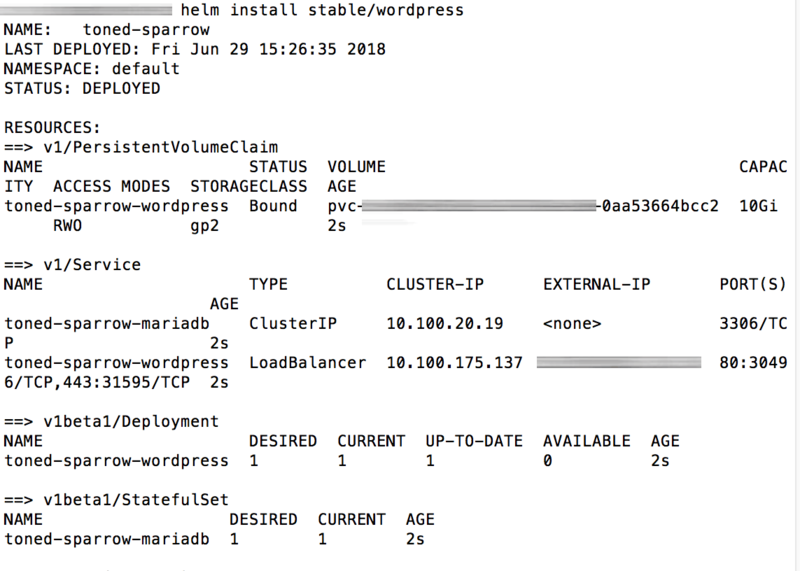 This guide will introduce you to Amazon EKS by provisioning a Kubernetes cluster and deploying the Bitnami WordPress Helm chart on it. 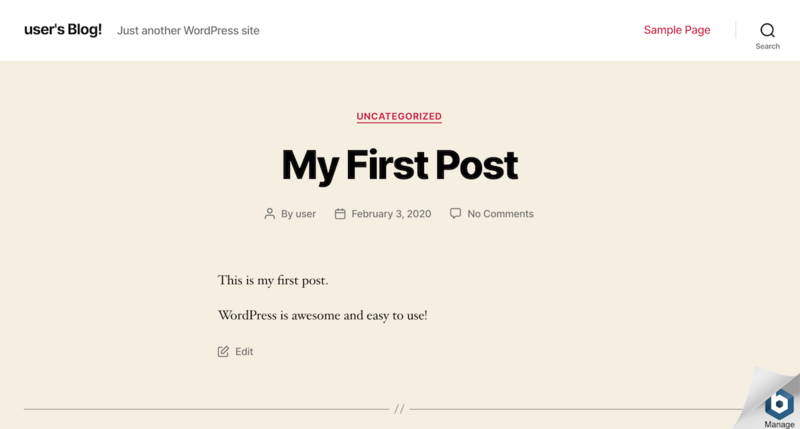 This will give you a pre-configured WordPress blog that you can start using right away. But WordPress is just an example: there are hundreds of other Bitnami applications to choose from, and they’re all equally easy to set up. 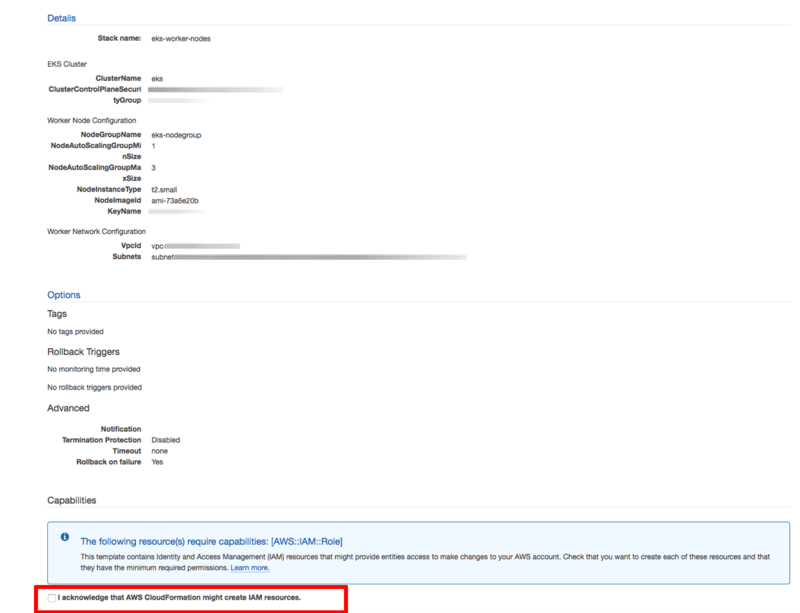 You have an AWS account with an active subscription and are able to log in using AWS IAM account credentials. If you don’t have either of these, create a new account and then create an IAM user in your AWS account. You have installed the latest version of aws, the AWS command-line interface (CLI), to a location in your system path. In case you haven’t, install it using these instructions. 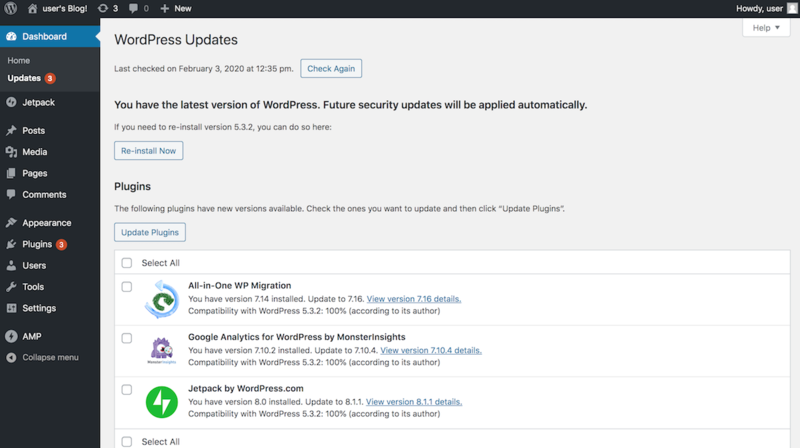 You have installed the latest version of heptio-authenticator-aws, the Heptio Authenticator for AWS, to a location in your system path. In case you haven’t, install it using these instructions. You have installed the latest version of kubectl, the Kubernetes command-line tool, to a location in your system path. In case you haven’t, install it using these instructions. NOTE: You must use kubectl v1.10 or later with Amazon EKS. IMPORTANT: At the time of writing, Amazon EKS is only available in the us-west-2 and us-east-1 regions. Therefore, before proceeding with the remainder of this guide, select one of these two regions in the AWS console and perform the operations listed below in that region alone. At the end of this step, you will have generated an AWS Access Key ID and Secret Access Key and created a local AWS profile to hold these credentials. If you already have an AWS Access Key ID and Secret Access Key and a local AWS profile, you can skip this step. Log in to the AWS IAM console using your AWS IAM account credentials. Select the “Users” section in the left navigation bar and search for your IAM user record. Within the user record, select the “Security credentials” tab and find the “Access keys” section. Click the “Create access key” button. A new key pair, consisting of an “Access Key ID” and “Secret Access Key”, will be generated and displayed. The “Secret Access Key” value will not be displayed again, so accurately down the “Access Key ID” and “Secret Access Key” values displayed. On your local system, run the following command to create an AWS profile. Enter the AWS Access Key ID, Secret Access Key and selected region when prompted. This will create a profile file in your home directory on your local system named ~/.aws/credentials. Typically, this file contains a default profile named default with your credentials. These credentials will be used when interacting with your Amazon EKS cluster. 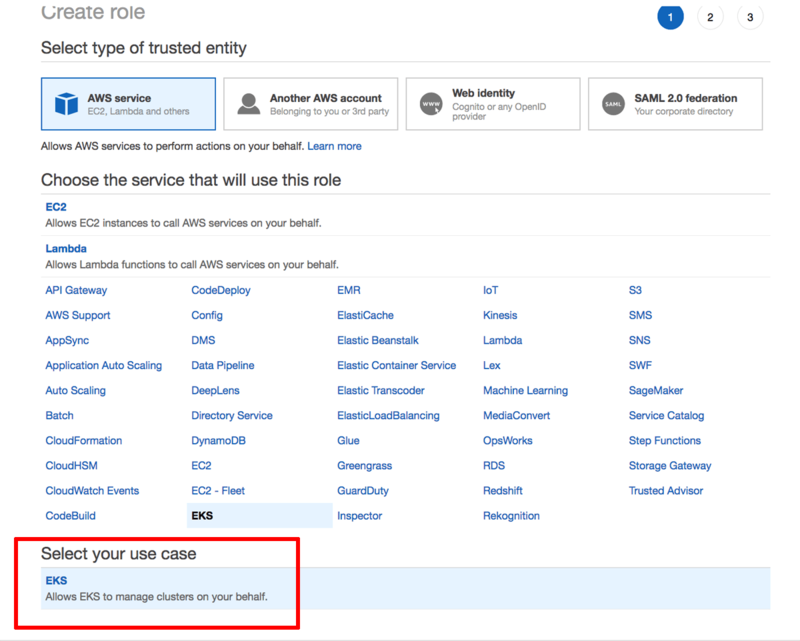 At the end of this step, you will have created an AWS IAM service role to handle operations related to your Amazon EKS cluster. Navigate to the AWS IAM console and log in (if you’re not already logged in). Select the “Roles” section in the left navigation bar and click the “Create role” button. Select “AWS service” as the type of entity and “EKS” as the service. Click the “Next: Permissions” button to proceed. Click the “Next: Review” button to proceed. Enter a name for the service role and click “Create role” to create the role. Note the name of the service role. 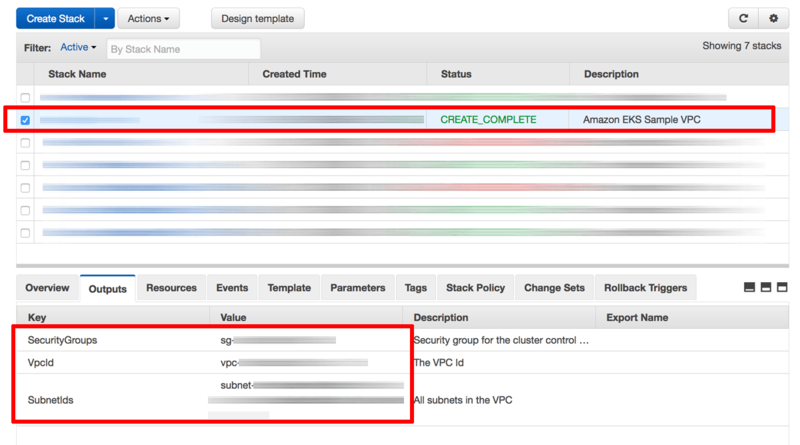 At the end of this step, you will have generated an SSH key pair to access your EC2 instances. If you already have an SSH key pair for the AWS region you are operating in, you can skip this step. From the Amazon Web Services menu, select the EC2 service. From the Amazon EC2 dashboard, select the “Key Pairs” option in the “Network & Security” menu. Click the “Create Key Pair” button. In the resulting dialog box, enter a name for the new key pair and click the “Create” button. A new key pair, consisting of an SSH public and private key, will be generated. You will be prompted to download the private SSH key to your computer. NOTE: You will only be able to download the private SSH key once. Store it safely as you will not be able to log in to your AWS servers without it. At the end of this step, you will have created an AWS VPC to host your Amazon EKS cluster. Navigate to the AWS CloudFormation console and log in (if you’re not already logged in). Click the “Create Stack” button. On the “Specify Details” page, enter a name for the new stack. Click “Next” to proceed. On the “Options” page, leave all values at their defaults. Click “Next” to proceed. On the “Review” page, review and confirm the details of the stack. Click “Create” to proceed. Stack creation will take a few minutes. Once complete, select the stack name in the list of available stacks and select the “Outputs” section in the lower left pane. Note the identifiers of the security group, VPC and VPC subnets. At the end of this step, you will have created an Amazon EKS cluster and configured kubectl to connect to its control plane. Navigate to the Amazon EKS console and log in (if you’re not already logged in). Click the “Create cluster” button. In the “Cluster name” field, enter a descriptive name for the cluster. Note this name as it will be required later. In the “Role ARN” field, select the IAM service role created in Step 2. In the “VPC” field, select the VPC identifier from Step 4. In the “Subnets” field, select the VPC subnet identifiers from Step 4. In the “Security groups” field, select the security group identifier from Step 4. 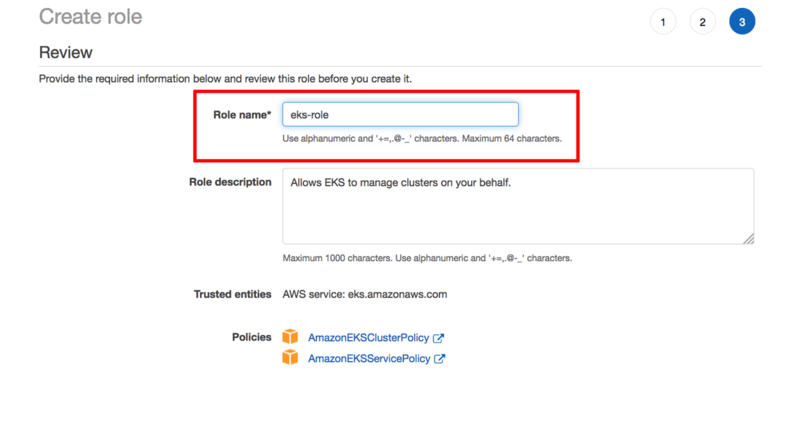 Click “Create” to create the Amazon EKS cluster. NOTE: If cluster creation fails due to insufficient capacity in your selected region or unavailability of subnets in certain zones, repeat the process using a different region. Cluster creation may take up to 10 minutes. You can monitor the status of the cluster from the Amazon EKS console. 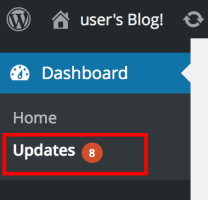 Once complete, the cluster status will change to “Active” as shown below. Select the new cluster in the Amazon EKS console. From the cluster details page, note the API server endpoint and certificate authority data. Replace the API-SERVER-ENDPOINT placeholder with the API server endpoint obtained from the cluster detail page. Replace the CA-DATA placeholder with the certificate authority data obtained from the cluster detail page. Replace the CLUSTER-NAME placeholder with the name of the Amazon EKS cluster. Replace the PROFILE-NAME placeholder with the name of your AWS credentials profile from the ~/.aws/credentials file (typically, default). At the end of this step, your Amazon EKS cluster will be fully operational. In the “Stack name” field, enter a descriptive name for the stack. Note this name as it will be required later. 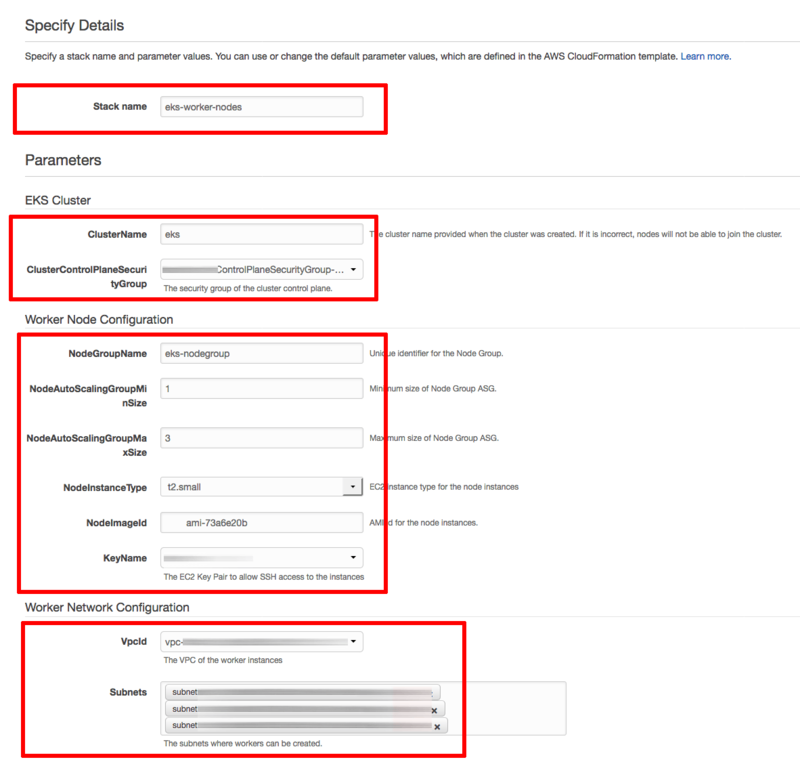 In the “Cluster name” field, enter the name of your Amazon EKS cluster as specified in Step 5. In the “ClusterControlPlaneSecurityGroup” field, select the security group identifier from Step 4. In the “NodeGroupName” field, enter a descriptive name for the node group. In the “NodeAutoScalingGroupMinSize” and “NodeAutoScalingGroupMaxSize” fields, enter the minimum and maximum number of nodes your cluster should have. In the “NodeInstanceType” field, choose a system configuration for the cluster nodes. In the “NodeImageId” field, enter ami-73a6e20b if you’re using the us-west-2 region or ami-dea4d5a1 if you’re using the us-east-1 region. 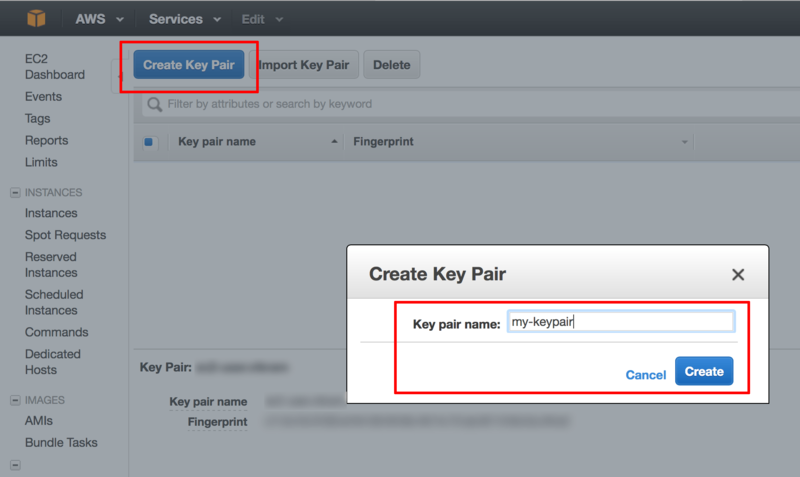 In the “KeyName” field, select the SSH key pair you created in Step 3. In the “VpcId” field, select the VPC identifier from Step 4. On the “Review” page, review and confirm the details of the stack and tick the checkbox to confirm that the stack can create additional IAM resources. Click “Create” to proceed. Once stack creation is complete, select the stack name in the list of available stacks and select the “Outputs” section in the lower left pane. Note the identifier of the node instance role. On your local system, create a file named auth.yaml and fill it with the content below. 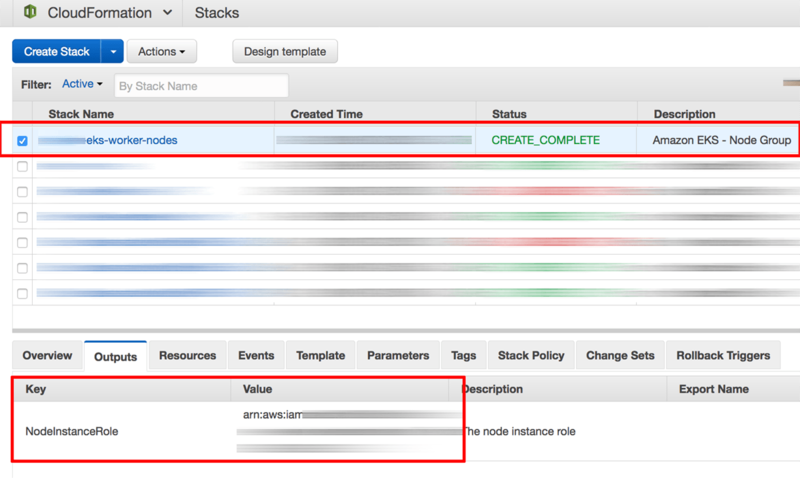 Replace the ARN-ROLE placeholder with the node instance role obtained from the stack output. 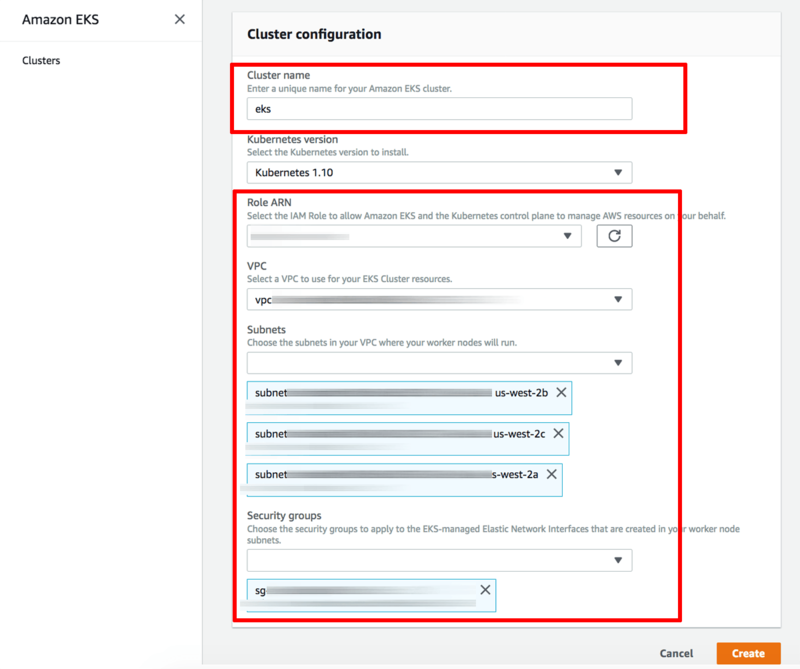 At the end of this step, you will have added a storage class to your Amazon EKS cluster, to enable provisioning of EBS volumes for your applications. At the end of this step, you will have installed Helm and Tiller in your Amazon EKS cluster. Helm is the easiest way to manage applications in a Kubernetes cluster. Helm allows you to perform key operations for managing applications such as installation, upgrade and removal. TIP: OS X users can also install Helm with the command brew install kubernetes-helm. 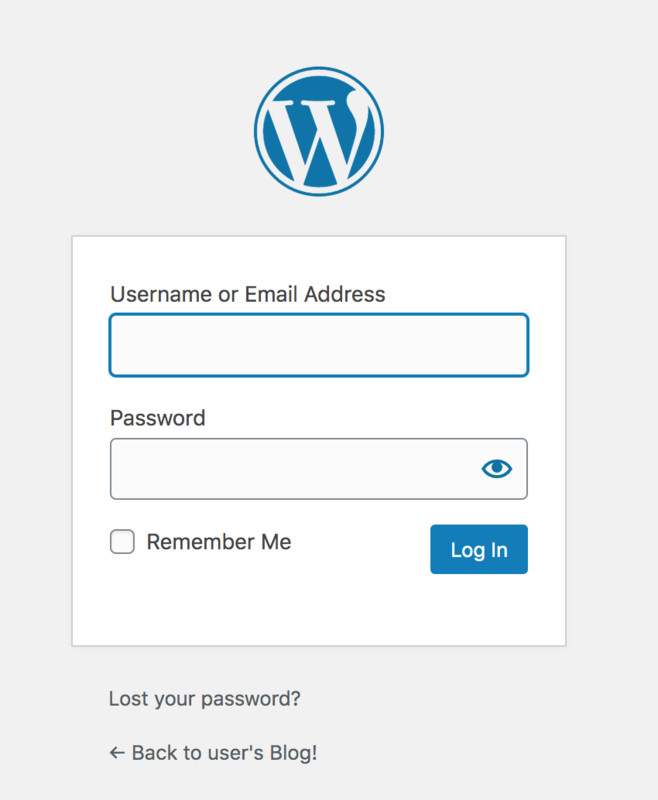 At the end of this step, you will have WordPress running in your Amazon EKS cluster. 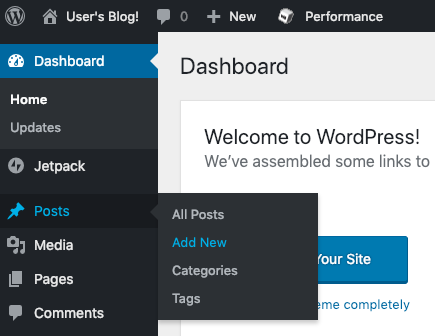 Once Helm is installed, you’re ready to deploy WordPress using the Bitnami WordPress Helm chart. You should see something like the output below as the chart is installed. Pay special attention to the NOTES section of the output, as it contains important information to access the application.